This post now also includes instructions for a more advanced kute-uchi braid called Genji Uchi, made using both the moves I teach in the two introductory videos below. See my post on the Kute-Uchi workshop I took at Braids 2012 for more about other types of Kute-uchi braids made using these two moves. Another interesting hand-held loop braiding tradition was used in pre-Incan Andean cultures to create the amazing “mummy braids” – see photos of hand-held loop braiding with over 60 loops at the end of that post (not a tutorial). Totally off-topic: at the end of the page below, I went on a bit about why I chose wordpress.com, and this particular format/theme for my site. I recently dashed off two video tutorials on kute-uchi braiding—a Japanese hand-held loop braiding technique. This was in answer to a youtube video request from Petr in the Czech Repuplic! He is very interested in both Kute-uchi and Kumihimo braiding—has now acquired plans for a marudai and is building it himself. The “inside-through” move is basically identical to V-fell finger-held loop braiding. But there is no equivalent to the kute-uchi “outside-around” move in traditional fingerloop braiding. Note—I just used “bare” loops in these videos. If you use kute (handles) to hold the loops, it will be easier to control the loops and to keep track of their order. Kute are not hard to make, see these ideas from Joy Boutrup and Maskako Kinoshita. (click link, then scroll down the footnotes on that page.) I didn’t use kute for any of the cotton and linen braids in the photo below, but I gather that fine silk would be very difficult to use without kute. In the videos, I tried to hold all the loops spaced apart so they would be easy to see. This is not absolutely necessary or even practical, especially when braiding with more than five loops. Just try to keep them lined up in order. Once you get used to these moves, you can try using 7 loops, and then more, to make larger versions with more color-pattern possibilities. Both these two Kute-uchi moves can make a divided, square, and flat braid, pretty much just like the braids in my “Start Here” 5-loop tutorial for finger-held loop braiding. New note: For making these simple square braids in the videos, traditional Kute-Uchi braiders would actually have used finger-held loops, as taught in my Start Here tutorial. According to Masako Kinoshita, hand-held loop braiding in Japan did not replace fingerloop braiding for simpler braids – fingerloop braiding has several advantages over handheld loop braiding if both are possible. But some more complex braids, like the Genji-Uchi braid below can only be made with hand-held loops. However, it’s easiest to learn hand-held loop braiding first with a simpler braid, like the 5-loop square braid, before moving on to more complex ones. Genji-uchi and Pseudo-Genji-Uchi braids, made using moves fr. both videos. 16-36 loops. Cotton, linen, wool. I explained the color set-up for the 3rd braid fr. left in an answer to a question in the comment field below this post. The examples above are 16- to 36-loop braids, which are equivalent to 32- to 72-tama (tama = bobbins) kumihimo braids. Even though they have different numbers of loops, they all have the same underlying structure—which is different from the square and flat braids of the two Kute-uchi videos above. When I learned my first Kute-uchi braids, the Outside-Around move of my second video was a big surprise to me. I had never seen anything like it with finger-held loop braiding. The braids above were very novel, too. The structure is like 2 square braids enmeshed through each other. Hard to tell in a flat photo, but the braids are very solid, and round or squarish in shape, with 8 ridges (these are the narrow vertical columns of stacked threads—a regular square braid has 4 ridges). Then a couple of years later I had another surprise, when I learned the 14th C. European “Sudarium braid,” done with finger-held loop braiding by two co-operating braiders (traditionally), which has a very similar shape—though produced by a very different method. Kute-Uchi in Japanese means loop braiding in general. Masako Kinoshita coined the term, and according to her it includes finger-held loop braiding within its meaning. (Fingerloop braiding almost certainly preceded hand-held loop braiding historically, and would always be the preferred method for simple braids of 7 or fewer loops, in Japan as well as the two other places hand-held loop braiding is known or assumed: Oman, and ancient Peru). None of this history was known until Masako Kinoshita discovered hints to the long-forgotten technique of kute-uchi in some old Japanese manuscripts. Amazingly, the documents revealed clues to the original method used for braiding the magnificent Japanese royal, samurai, and temple braids: hand-held loops and many cooperating braiders. This was completely counter to the theories of kumihimo historians at the time—they all believed the ancient braids had been made on braiding stands (marudai), even though a marudai big enough for the most complex of these braids would have to be so large that it could not be used by a single braider sitting in one place. This is totally parallel to Noemi Speiser’s amazing discoveries from the 17th C. English loop braiding manuscripts. Speiser and Kinoshita were both discovering and decoding ancient loop braiding texts and braids at almost the same time, on opposite sides of the earth. Both of them had to use a lot of ingenuity—the instructions in both sets of manuscripts were obscurely written, and incomplete. The 17th C. English manuscripts, which were the first ones Speiser came upon, were written as if for readers who already understood the basic method and undefined shorthand terminology—most of the essential information was simply omitted. When Kinoshita came across the Japanese manuscript describing Kute-uchi braiding, the last practitioner of kute-uchi had been gone for almost a century, and the technique had been forgotten / sunk into obscurity for even longer, supplanted by Kumihimo stand-and-bobbin braiding. Kinoshita was eventually able to prove to the initially skeptical Japanese Kumihimo community that it was hand-held loop braiding techniques, not marudais or any other types of braiding stands, that had been used to make the ancient, very intricate braids that are now national treasures in Japanese museums. The larger kute-uchi braids (kikko and other patterns) were made by two to four or even more braiders working together on one braid. This is a simple version—the amazingly elaborate versions that were done in the past (I think only for royalty?) were much wider and more complex, with many rows of nested diamond shapes forming intricate patterns, not just one row of diamonds like my example. Makiko Tada has made incredible replicas of some of these ancient braids. This braiding structure is now usually done with Kumihimo braiding. A specialized braiding stand called a Karakumidai is used. Each pair of threads is wound on two bobbins which hang separately, rather than being held together as a loop, the way they were originally braided. First learn the braiding moves in both the videos above—Pseudo-genji and Genji-uchi use a combination of both those moves. An 8-loop version will look more like the braids in my photo. The total number of loops must be a multiple of 4, (so 8, 12, 16, etc). Decide what colors you want half of the columns to be, and what colors you want the other columns to be. CUT THE YARN: Half the loops should be color group X, and half should be color group Y. It’ll be easier to braid if at least one of these two groups is a single, distinctive color—say, all black. The other color group could be one other color, or a mix of colors, but if they are a mix of colors, each color should contrast well with black or it will be difficult to see which loops to braid. ALTERNATE the two groups of colors [color group X and color group Y] when you arrange the loops onto each hand. The loops should be in X, Y, X, Y order on each hand…Meaning the same, (mirror-image) matching order on both hands). Unlike the braids in the videos, Genji-uchi and Pseudo- g.u start with the same number of loops on each hand. So the loops should be, say: Black, Bright, Black, Bright (left to right) on the LEFT hand, with the same exact colors (but right to left) on the RIGHT hand. The columns look clearer in the braid if one of the two color-groups is a single, solid color—say all black loops for the even-number loops (color-group X). This also makes it much easier to keep the loops in the correct order on your hands while you are braiding. The first 2 loop transfers (left and right) will be outside-around moves from the second video, and the next 2 will be inside-through moves, demoed in the first video. Repeat in this way for the whole braid. If you’ve lined up your colors correctly, you will be making the outside-around moves on all the X colors, and inside-through moves on all the Y colors. For Pseudo-genji-uchi: TURN all loops when transferring them. For true Genji-uchi : TURN only the loops that go “outside-around,” and DON’T turn the loops that come “inside-through”. The two braids are very similar-looking. If you use bicolor loops, there will be a difference in where the colors end up in the vertical columns in Genji-uchi vs. Pseudo Genji-uchi. I am not 100% sure that the true Genji-Uchi braid will work with only 4 loops, you’ll probably need to use 8. (let me know what happens if you try it with 4!) I do know that the “pseudo-genji-uchi”—turning all the loops—does work with only 4 loops, I tested that, then forgot to test it for the true Genji-uchi braid. Try not to get the loops out of order, or the color-pattern will disappear. If you notice that they are out of order, get them back into that alternating x-color, y-color order and keep going. Keep alternating the two sets of moves. Try other color-arrangements, but (for these two braid structures) always use the same two moves (2 outside-around, 2 inside-through, 2 outside-around, 2 inside-through, etc). And you must use 8, or 12, 16, 20, etc loops (a multiple of 4). C-whether the two hands hold an even or odd number of loops (or one hand even and the other odd). Unlike fingerloop braids, even-odd variations can cause dramatic changes to the form/shape of hand-held kute-uchi braids. 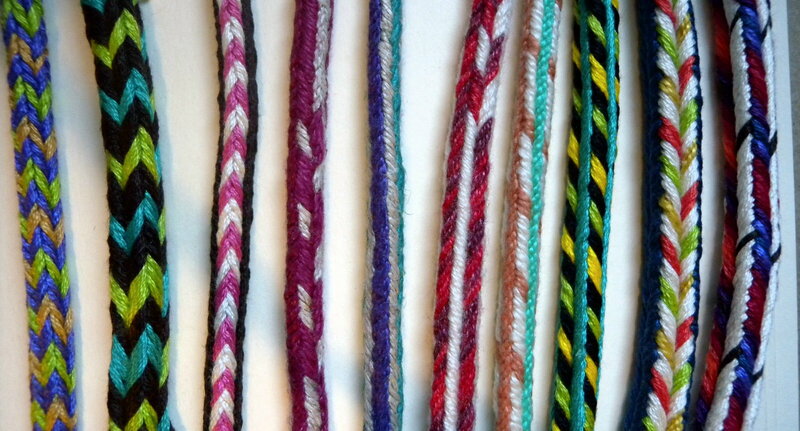 An 8-column wide, flat braid similar to the European-style flat double braid). It is braided as four layers, connected like a folded paper fan, that later are opened out into one flat, wide layer. These braids are as intricate as typical European fingerloop two-worker braids (double braids), especially if you use 10 or more loops. On top of that, if you pair up with another braider and team braid, they can be combined to be even twice as large and intricate. Equivalent to a European 4-person braid! Masako Kinoshita describes these kute-uchi braids on LMBRIC, in her illustrated instruction series on Kute-Uchi. The braid possibilities I itemized above would be in her list headed “Four-step Procedures,” because the braids have 4 loop transfers in each full cycle (a cycle = one repetition of all the braiding moves). Two-step procedures make simpler braids (square, flat and divided), that have only two loop transfers in each braiding cycle. * There will be 4 color columns (two each of the two color-groups), but each color column is really made up of 2 adjacent (same-color) columns of slanting threads. However, if you used bicolor loops for this braid, you could use 4 color-groups, arranged so the braid would have eight (narrower) columns of these 4 colors. My site is part of WordPress.com. WordPress.COM [not.org! ]is a hosting platform that spares you from doing much if any behind-the-scenes tech-type work, and offers several pre-fab blog formats/ looks (called “themes”), that you can switch between freely. I’m trying this new theme mostly because its upper menu tabs stand out better than the ones in my old theme. I hope the overall change in the blog’s appearance isn’t too jarring! Update Dec 2013 – after two years on that ‘new’ theme, I’ve just switched to yet another one that also has a prominent upper menu. It’s supposed to work better on different sized devices than the previous one did. The main problem with using a typical blog format for a teaching/ information-based site is that all the published posts are displayed on the homepage in chronological order—newest on top. This is not necessarily good for a sequence of tutorials jumbled together with non-tutorial posts! That’s why I later added upper menu tabs so readers could find specific tutorials and other information without having to wade down the blog’s homepage. It turns out that a wordpress.com site really can be made to have a traditional website look, with a static homepage, and the content all organized in navigation menus, all you have to do is select a static page to be the home page. But by the time I found that out, I’d come to like the blog-style better anyway. To me it looks more personal and more interesting if the home page updates/changes when I make a new post, plus apparently it improves one’s ranking in online search algorithms. Also, because I thought of this as a blog rather than a website, it was less intimidating to get started. I didn’t feel that all the pieces had to be in place when I launched it, so it was (slightly) less scary to jump in and just start posting. I hadn’t even dared make a video yet at that point, had been procrastinating on that for a year or more! As my posts began to accumulate, I gradually figured out ways to organize them, and finally made the jump into creating video tutorials. In case you are interested in starting your own blog or website, the main reason I chose WordPress.com rather than wordpress.org is that WordPress.com basically does everything for you other than type in the content! I didn’t have to understand anything about web design, hosting, html, etc in order to start my site. I understand a lot more about this stuff now, but I didn’t ever need to. Also I didn’t have to do my own spam-blocking or protection from being hacked. This is not the case with a WordPress.ORG install – you are totally on your own with that. You get the theme/format for free from WordPress and then go “self-host” meaning I assume that you find a hosting platform, and do all the technical work yourself, find security programs on your own etc. (see WordPress’s own more non-committal comparison of their two services: wordpress.com vs wordpress.org) People who self-host get hacked all the time. I know that from all these years of reading the users’ forum for WP.com – because of the name confusion there are always a few WP.org blog-owners who erroneously come there with their problems before getting redirected to the .org forums. Far as I have seen, it’s ONLY the .org people who ever get hacked, and presumably anyone else who self-hosts. It doesn’t ever seem to happen on WordPress.com unless you actually give someone access to your site. Instead users gripe about updates and changes (myself included sometimes!) but they never gripe that evildoers hacked their site and locked them out. All I needed to know how to do was to read simple directions in the WordPress support pages, and ask questions on the users’ forum if I ran into trouble. Everything worked and looked good right ‘out of the box’ – all I needed to do was type in some content, and upload the photos. This is all explained in the little WordPress user tutorials in the Support pages – you do have to look at those to get started, so there is a learning curve in the beginning, but it is a much easier curve, with a lot more protection than self-hosting somewhere with a WordPress.org blog template would be. Plus, if you decide you want to go that route later on, you are free to export your content, stats and followers to a self-hosted site at any point. With wordpress.com I suppose you have less ability to tinker with your site, but you get one that is already functional, looks good, with great spam control and stats monitoring, and almost zero chances of being hacked, which is not the case if you self-host. I really didn’t want to spend a lot of time designing my site (even if I had the know-how!) There is already so much to choose between with the multitude of themes available that I didn’t feel like a carbon copy of any other sites. I could alter the look of my site simply by uploading my own header image, picking between various color options within each theme, etc. And, according to people who understand this stuff much better than I do, the WordPress.com platform has great SEO (search engine optimization) magic that starts your blog off with much better visibility in online searches than your own self-hosted wordpress.org (or other) install would. That said, it still took several months before this site started to appear anywhere near the top 10 pages in a google search for loop braiding – be patient and keep posting, even if it seems at first that you are posting into a void! Apparently it would have taken even longer if I had self-hosted on Go-Daddy or wherever. Anyway, I’m hoping this new theme/format will be easier to read and navigate. If it doesn’t work out, I may try yet another one — so if everything looks different again the next time you visit, now you’ll know why! Wheres the tutorial for the arrow braid? Do you mean the third braid from the left in the group photo? Sorry, but I didn’t make separate tutorials for all the color patterns I show in that picture. All the braids in that photo are Genji-uchi or Pseudo-genji-uchi braids, all made with the same braiding moves, just with different numbers of loops, and different color set-ups. First learn the braiding moves in the two videos at the beginning. Then learn the 8-loop Pseudo-Genji-Uchi braid from the text-only tutorial above (holding four loops on each hand). After that, you would be able to learn that “arrow” pattern braid. It’s a Pseudo-Genji-Uchi braid (this means that EVERY loop is turned when transferring it to the other hand). This particular example had 16 loops (8 on each hand). I used embroidery floss, but any smooth strong yarn or thread would work. 8 loops have one red shank and one black shank. 8 loops have one white shank and one black shank. 4 red/black loops with red shanks uppermost, then 4 white/black loops with white shanks uppermost. RIGHT Hand loops should be the mirror-image of the left loops in color arrangement (so arrange them right-to-left), EXCEPT that on the right hand, all the loops should have their BLACK shanks uppermost, with their red or white shank lowest. 1. take Left hand’s leftmost loop AROUND the other left loops to end up as Right hand’s leftmost loop (and turn the loop while transferring it). 3. take Left hand’s leftmost loop THROUGH the other left loops to end up as Right hand’s leftmost loop (turn the loop while transferring it). 4. Do the same thing in mirror-image to the Right hand’s rightmost loop. (another THROUGH move, with a turn). If you don’t turn each loop when transferring it, the color pattern will be completely different. After 8 repetitions of the above braiding moves, the colors should all be back in the same order on the hands as they started. If they never come back to that order, a mistake has been made in the braiding procedure. Good luck, please let me know if anything isn’t clear. hi im konica.awesome blog! your work is very inspirational,i just loved it..well i’ll b trying some of your works too.feel free to explore me at http://scrapsmania.wordpress.com and do share me your views.i want to see more of your creativity so im hitting ‘follow’. Hi konica, thanks for following! Ingrid merry christmas and happy new year 2012. Hi Petr, Thank you! I wish you the best, too. Merry christmas and happy braiding in 2012!